FORT LEE, Va. (April 20, 2011) - Regardless of where they're fighting, operating or training, Soldiers require supplies to accomplish their mission. 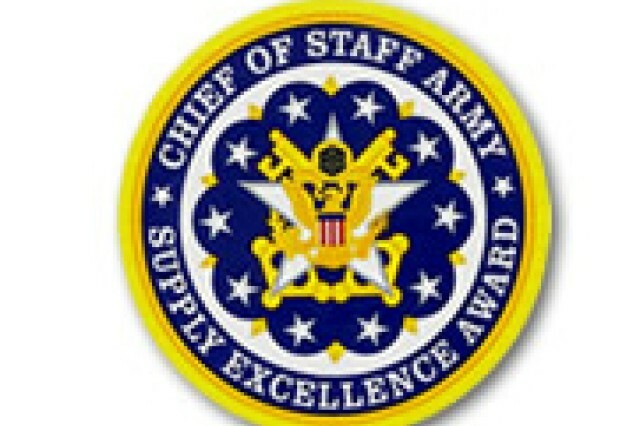 The Supply Excellence Award recognizes those who keep the Army moving by providing superior supply operations for the active Army, National Guard and Reserve components. The SEA program started in 1986 to highlight the critical role sustainers play in supporting the warfighter. The purpose is to increase the logistical readiness of all Army units; enforce the Command Supply Discipline Program; encourage the use of available resources; and provide a structure for recognition of group and individual initiatives. According to the SEA evaluation team, "participating units have a strong knowledge of regulations and well established CSDPs. They use the evaluation process as a training aide for improving operations while the recognition derived from winning, and the public awareness of supply excellence, creates competition and unit excellence." To determine winners, the SEA evaluators travelled all over the world to inspect, grade and evaluate units in various areas of supply operations. Some areas evaluated included unit standard operating procedures, records management, financial data accuracy and inventory accountability. While some units use the competition to make their overall supply program better, others took the competition on as a challenge. "Some units who had just returned from deployment, and were preparing to deploy again, looked at the competition as a challenge," said Chief Warrant Officer 5 Mary Apodaca, active Army SEA evaluator. "Because of their established standards and strong command support, units were able to not only compete while gearing up for deployment, but also win this year's competition in their category." Units will be honored during the Combined Logistics Excellence Award ceremony at the Greater Richmond Convention Center May 12. The SEA, along with the Army Award for Maintenance Excellence and the Deployment Excellence Award, recognizes those organizations that have attained logistics superiority. The ceremony is the culminating event after the Sustainment Commanders Conference and Association of the United States Army Sustainment Symposium, May 9 -12. The Quartermaster School, Combined Arms Support Command, manages the program and receives support from the National Defense Industrial Association, Association of the United States Army, and Department of the Army G4/Logistics. Winner: Company B, 53rd Signal Battalion, Fort Meade, Md. Winner: Battery F, 1st Bn., 19th Field Artillery, Fort Sill, Okla. Winner: 2nd Heavy Brigade Combat Team, 1st Infantry Div., Fort Riley, Kan.
Runner-up: 4th Military Information Support Operations Group (Airborne), Fort Bragg, N.C.
Runner-up: 204th Brigade Support Bn., 2nd BCT, 4th Infantry Div., Fort Carson, Colo.
Runner-up: Headquarters & Headquarters Co., 160th Special Operations Aviation Regiment (Airborne), Fort Campbell, Ky. Winner: Aviation Center Logistics Command, Fort Rucker, Ala. Winner: Detachment 2, 165th QM Co., Seward, Neb. Winner: HQ Co., 66th Troop Command, Jackson, Miss. Runner-up: HQ 209th Regional Training Institute, Ashland, Neb. Winner: HQ 254th Transportation Bn., West Palm Beach, Fla.
Runner-up: Joint Forces HQ - Florida, St. Augustine, Fla. Winner: 110th Multifunctional Medical Bn., Lincoln, Neb. Runner-up: 113th Sustainment Brigade, Greensboro, N.C. Winner: 721st Troop Command, Milford, Del. Winner: U.S. Property and Fiscal Office Indiana, SSA, Indianapolis, Ind. Winner: 396th Medical Co., Winston Salem, N.C. Winner: Area Maintenance Support Activity 39, Topeka, Kan.
Runner-up: HQ Detachment, 1394th Transportation Brigade, Camp Pendleton, Calif. Winner: 1011th QM Co., Detachment 1, Pittsburg, Kan.